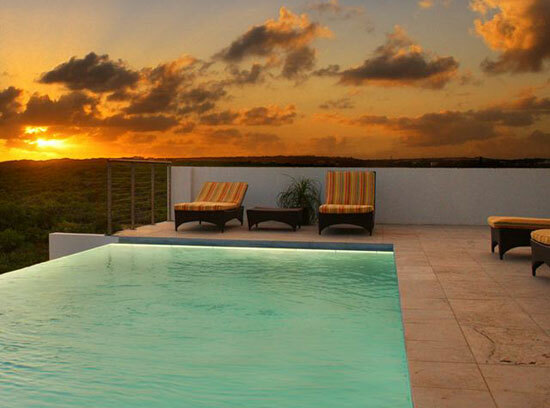 A Tequila Sunrise in Tequila Sunrise Anguilla Villa! Friends of mine were renting this villa and had me over for a night of tranquil dining and drinks. The first thing I noticed while heading over to meet my friend? The drive was so scenic! The road weaves you past Long Pond Bay which is a unique and spectacular sight. The waves on the bay come rushing in toward you as you drive by and you can see over to the Sandy Hill and Seafeather area (which is full of villas). All of this as you head out to a villa that sits next to only one other villa and is otherwise surrounded by lush greenery including those gorgeous frangipani trees. Just as the Tequila Sunrise concierge greets a guest renting the villa, my friend shared with me the welcome cocktail and, naturally, the house drink... a Tequila Sunrise. Trust me when I say that this cocktail after any amount of travel is a welcomed treat. Not only is it aesthetically pleasing, it also tastes divine. 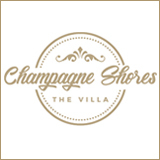 While the entry and greeting is special, there's more to this villa than its unique name and amenity. 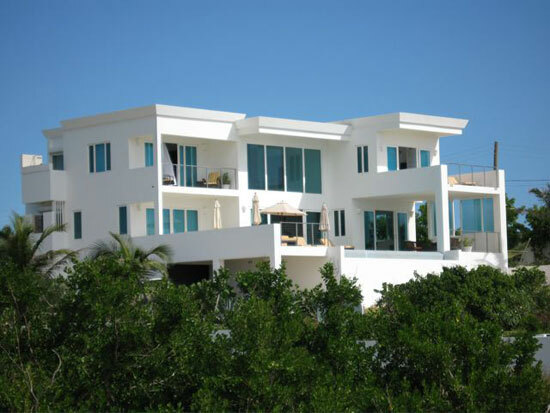 Now you wonder, how did a gorgeous, white, modern, oceanfront villa get such a name? 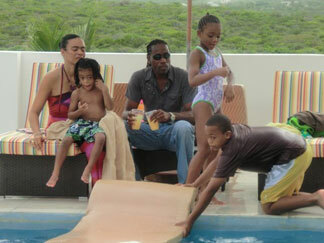 You'll need to read about the Globus family's Anguilla villa adventure below to find out. Who would have thought that a simple day trip to Anguilla could lead to the existence of an oceanfront, 3 bedroom house, complete with pool and views of St. Martin? 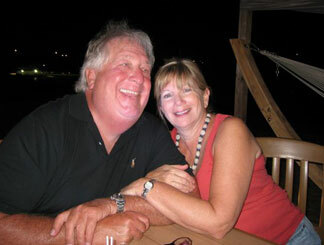 That simple day trip to Anguilla led to many more returns, over many years for Joel and Robin Globus of New Jersey. 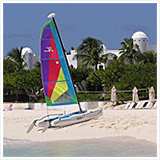 The Globus' had fallen in love with the island of Anguilla, as many do who dare venture over from the more hectic island of St. Martin. Trip after trip to Anguilla, they were hooked for life and decided it was time to set some roots. 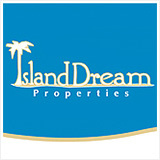 They made a big decision to build their dream home on their favorite island and they picked a spot only 150 feet from secluded Dropsey Bay. From time to time, you may hear it pronounced as "Josbie" Bay. 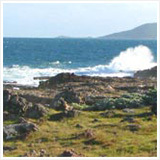 Dropsey Bay is on the southern side of Anguilla, which overlooks the magnificent mountains of St. Martin. 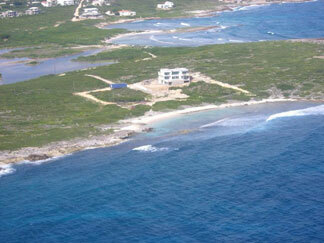 Who knew that their home would one day overlook the island that lost their attention once they discovered Anguilla? 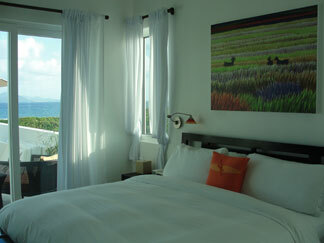 It really is more beautiful to be on Anguilla overlooking St. Martin, than the other way around. The Globus' were not alone in their quest to build their dream house. After making the initial big decision to even do it, they called on the help of many, ranging from people in Anguilla and all the way across the world in Indonesia. First things first, they needed land. They used a local real estate agent named Theo Smith to find where they would build. They worked with attorneys at Keithley Lake & Associates to get through all of the legal necessities, which can be a tricky process. 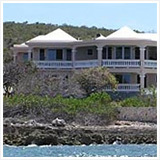 The architect was hired based on the Globus' having seen his work on some other homes in Anguilla. His name? Ian Edwards, aka "Sugar George". Between he, his wife Janine, and the Globus' they were able to pen a plan in several months. That plan came to life with the help of Leroy Gumbs (of Leeward Construction) and his consistently hard-working crew. Since the Globus' were in New Jersey for much of the time that Tequila Sunrise was being built, the project manager Fritz Smith, sent pictures to them so they could see the progress each week. It took exactly one year to finish, which the Globus' have been told may possibly be a record! Maris Edwards of ME Designs is credited for Tequila's color scheme, furnishings, and most of the decor. Joel himself designed the large living room sculpted metal light fixture. He even had to charter a boat to get it to Anguilla from St. Martin, it was so big. He is also responsible for the giant wooden farmhouse door. 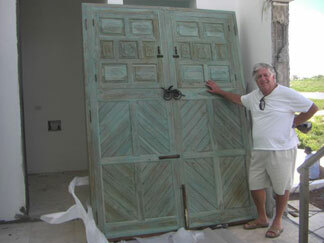 He found an old French farmhouse door online and had it replicated in Indonesia. Having seen this door in person, I can report that the photo does not do it justice. The door, created to look worn, has hints of pale turquoise throughout it and reminds one of nothing other than the sea surrounding Anguilla. The Globus' also decided on blue-tinted windows which are hurricane proof and cut down on heat and ultra violet ray penetration. 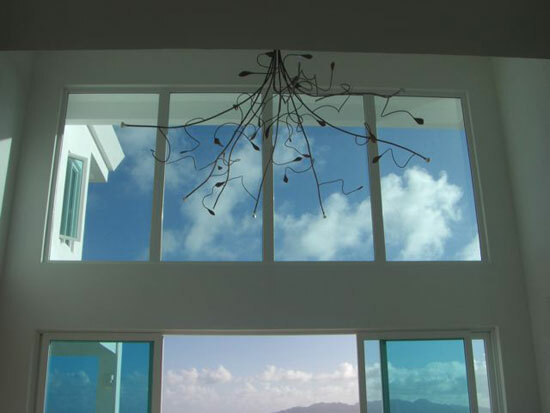 This glass gives Tequila Sunrise the freedom of not requiring hurricane shutters. The shade of blue against the white of the house itself is gorgeous as the villa then matches with blue Caribbean sky and white puffy clouds above. Brilliant! As the decorating continued, they chose paintings by resident artist, Lynne Bernbaum. Her work is throughout the villa, which is a remarkable pleasure. 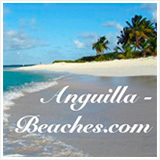 You can read more about Lynne Bernbaum's Anguilla art, here. 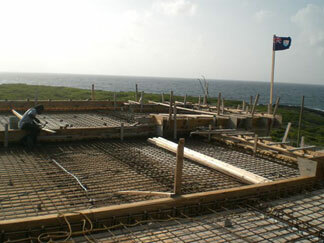 The whole family, including Joel and Robin's two sons Cory and Justin, were part of the building process in Anguilla. In fact, Cory and Justin named the house! One day, as the family enjoyed a day at the beach, they were discussing what they should name the house. 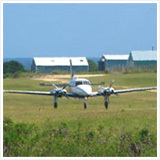 Scilly Cay is a family favorite for the Globus'! Both sons simultaneously looked up at their father who was sipping his favorite cocktail and said, "Tequila Sunrise". 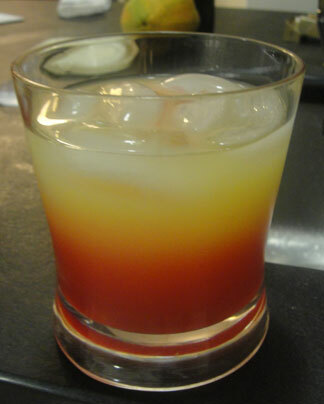 Tequila Sunrise, every day, keeps a lovely view of the renewing powers of the rising sun. Yes, Tequila Sunrise worked! 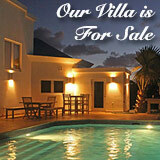 The family was excited to have created their "villa name" as they spent time together in Anguilla. They built their home as a family (the best part) and watched it grow together. They wanted the house to have a very open feeling to the courtyard and stairs. 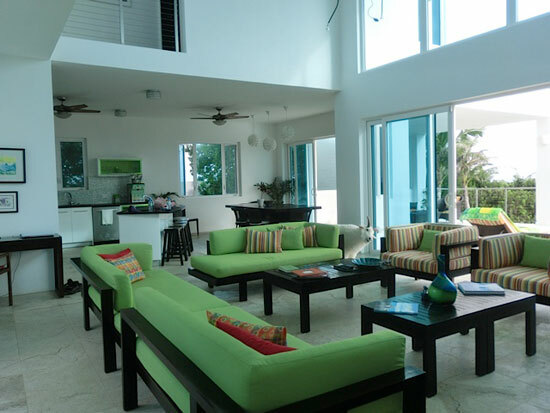 The living room is open to the pool, the kitchen, and the dining area. The second level walkway overlooks the living room - more of the nice open feel which is conducive to the view as well. The second floor walkways overlook the area. Beauty, comfort, and maximizing the view were top priority for everyone involved in this pursuit. For example, all of the three bedrooms are master suites. Two are on the second floor and one is on the first. They are very private and they all face the ocean view too! Each masters' bathroom is extra large and complete with gorgeous outdoor showers and nice soaking tub inside. 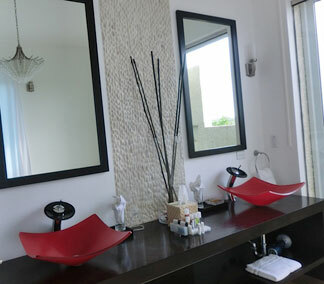 If you happen to be renting Tequila Sunrise, you will be spoiled by the Korres bath and beauty products as you indulge in the large, luxurious bathrooms. In addition to those special Greek products are slippers, robes, plush towels, and divinely soft sheets. Ahhhh, now that sounds relaxing. Also, for a touch of comfort and entertainment, the Globus' have a library where the keep a variety of classics, up to date best sellers, and even some games. Don't forget, there is Patron Silver on tap for whenever you like. Cocktails and games overlooking the Caribbean Sea and St. Martin. Sound like a dream? 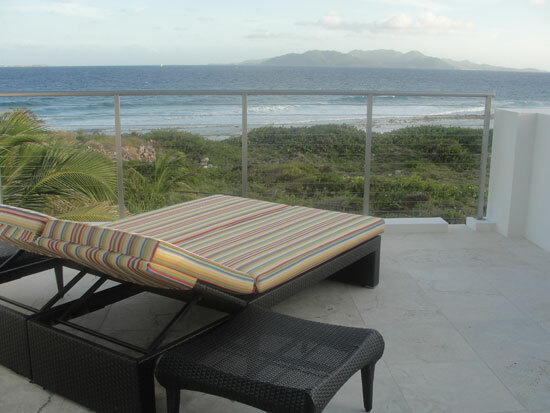 The views are maximized with all bedrooms having a sea view. Each bedroom's bathroom also has a glorious outdoor shower. The bedrooms all have outdoor access to a verandah. You can utilize the windows and doors to generate open air circulation or turn on the air-conditioning if that is your preference. Tequila Sunrise has both covered and uncovered outdoor space. 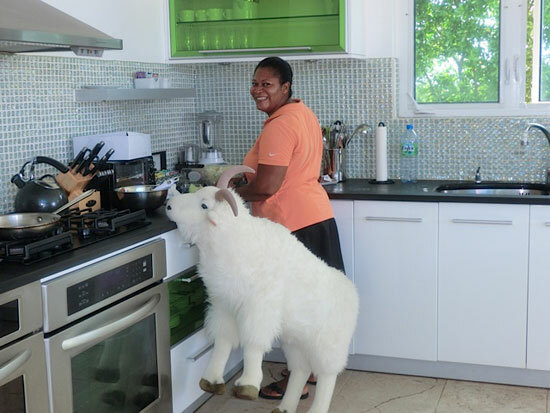 I've noticed that not all Anguilla villas have this amenity. Note: It can get hot and if you want to have your lunch outdoors you can eat in a covered area. Likewise if you want to catch full-on rays of the sun, you can rest your body in a lounger outside of a covered area to get your tan. This is lovely given some villas didn't think all of these needs through when being designed. 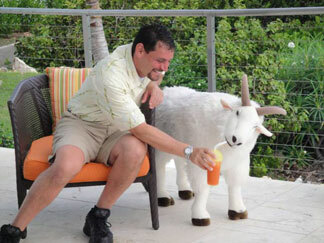 "Billy" is a stuffed goat that was given to the Globus' as a gift from Joel's sister, Lynn. Billy stays at Tequila Sunrise year-round and is there for any action or relaxation that guests may have in mind for him. He's even attended a bachelorette party and wedding (dressed in a tux). How fun! More on Billy. These days, the Globus' rely on a different team of people for assistance with their home. These genuinely sweet and caring people keep their beautiful home immaculate. 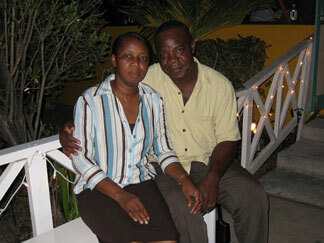 The Globus' believe no one can do better than their Tequila Sunrise concierge and villa manager, Kenroy Herbert. 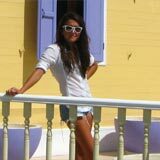 Heather Heyliger manages the housekeeping and treats Tequila Sunrise as if it were her own home. She is personable with the guests to Tequila Sunrise and really loves children. Heather will be the one making your breakfast and she also makes a tasty cocktail. Breakfast is included if you rent Tequila Sunrise, and as you know by now, the Patron Silver is free-flowing. No detail at Tequila Sunrise is overlooked. On that note, a bittersweet part of owning Tequila Sunrise is, while the Globus' wish they could be at their dream home all the time, work duties in New Jersey require them to be away from Anguilla for some of the year. That is the bitter part. 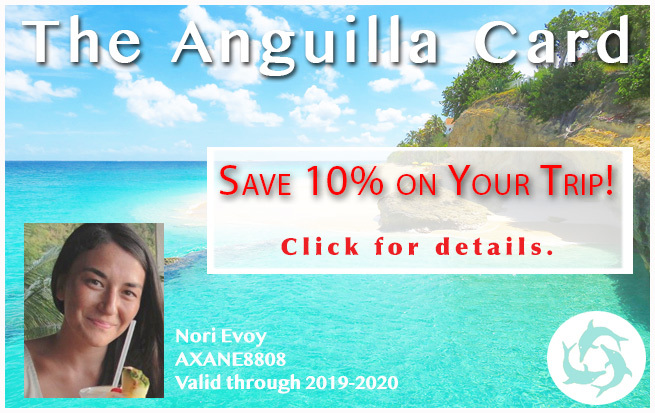 The sweet part is that this enables them to share their amazing Anguilla villa with guests who can make their own wonderful memories at Tequila Sunrise and in a way, feel like they have their own Anguilla villa. Perhaps one of the most special memories made at Tequila Sunrise took place not too long ago. A wedding party took over Tequila Sunrise and the couple, Jennifer and Lorne, got married on the beach by the villa. A perfect, intimate way to enjoy such an important time when two people and two families merge! 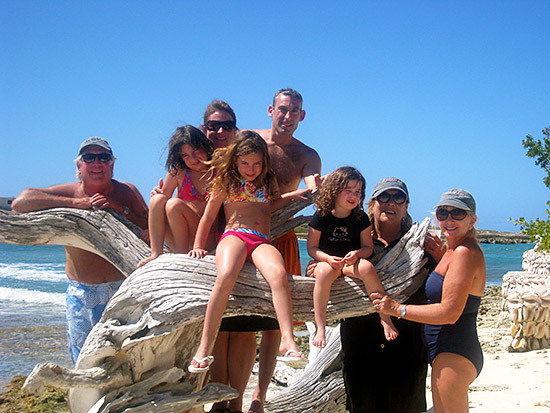 Guests creating their own great family memories in their home is important to the Globus family. Jennifer "trashing the dress" in the Tequila Sunrise pool! What makes this spot even more romantic? The Globus' have unofficially renamed Dropsey Bay, "Lover's Cove". How ideal for wedding vows! Joel lost his wedding band in the water of the bay and the Globus' will forever be connected to Dropsey Bay / Lover's Cove for that reason too. 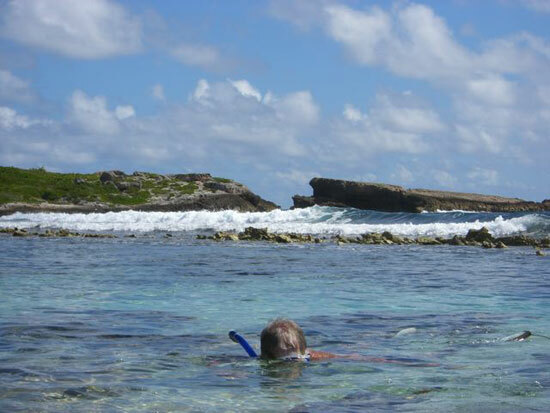 Joel snorkeling in Lover's Cove. Could he possibly be searching for his wedding band? 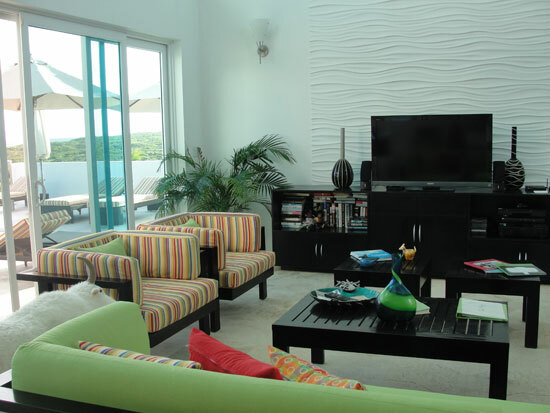 This Anguilla villa really is unique in its own right. Tequila Sunrise boasts the best of the best... 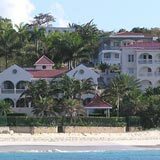 Ocean front with St. Martin and St. Barths views, a secluded sandy beach, pool, all bedrooms facing the sea, high-grade amenities, "Billy" goat, five-star hospitality, and a special story of family, unity and endless magic memories.